You can not do it alone, we can only succeed toghether ! Serge was born in 1961. After mechanics-school, his professional carreer passed on from nuclear powerplants to the aviation world with about 15 years at Sabena. He spent 5 years as a specialised mechanic on Boeing 737 and then stepped over to 'Loadcontrol' (the famous Red Caps) for another 10 years. Due to the bankruptcy of the national airline company, his carreer was directed towards telecommunications. For more than 20 years now, he's writing and reporting as a freelance journalist for various magazines and other internet sites. He creates the SBAP site in 2004. His aim is to share the passion and the joy the world of aviation brings to us. (Association des Journalistes Périodiques Belges et Etrangers). Serge is the responsible editor and web master of SBAP. Marc was born in 1961. This police officer has always been interested in aviation in general and more particularly in the Belgian Air Force. 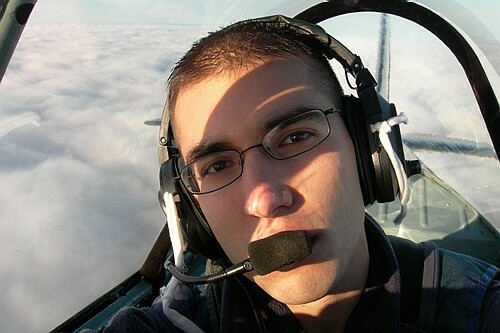 Although he could not fulfill his dream to become a fighter pilot, he did get his pilot licence (non-IFR) and totalizes 652 flight hours on different aircraft types. Becoming acquainted with the Belgian Air Force Alpha Jet display pilots, Danny Payeur and Pat Deschrijver, he fell in love with this aircraft. 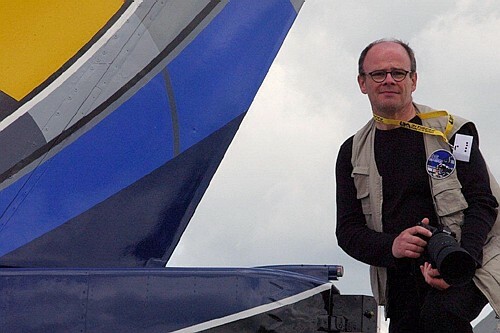 As he did not find any thorough publication on the subject, he elected to do some research wich led to his book "20 years of Alpha Jet in the Belgian Air Force". 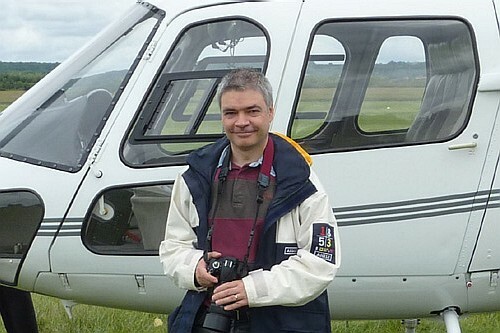 He is now in his fifth year as a freelance aviation reporter/photographer. Alain was born in 1955 in Liège and has lived there since 1981. During his youth in Trooz, he watched some F-84F, F-104G and Mirage V, which were passing at very low level guided by the "Olno" radio station. This was the starting point of his aviation passion. 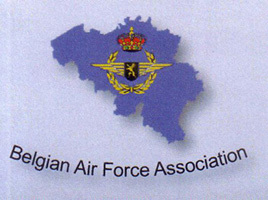 After his management studies at the HEC Liège, he completed his military duties as a reserve officer candidate in the Force Protection (UDA) of the Belgian Air Force and more particularly with the 3rd Tactical Wing at Bierset, spending his days off at the 8 Sqn by sharing the daily job and activities with the pilots. He continued to serve the 3rd Wing as a reserve officer until 1988. 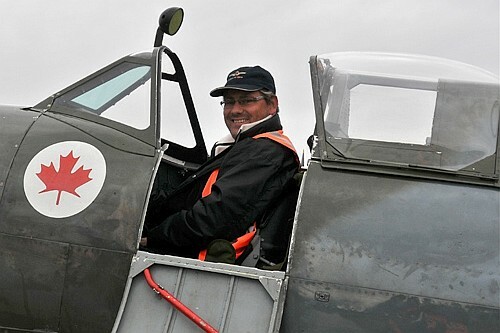 Then, for a few years, he lost his lead a little bit until July 2001, when his son decided to join the Belgian Air Cadets and started his fighter pilot career in 2003. 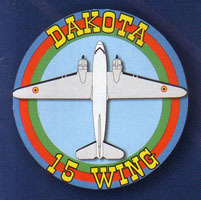 His son flies within the 350 Sqn of the 2nd Tactical Wing at Florennes. In December 2013, he reported on the reopening of the Bierset White Bison Museum, and since then has been involved in SBAP's activities by producing from time to time photographic and/or editorial reports. Alain is passionate about student pilot promotions. Having lived this adventure himself with his son, he invests to keep this beautiful hours in memory for history. Philippe was born in 1970 in Tournai. 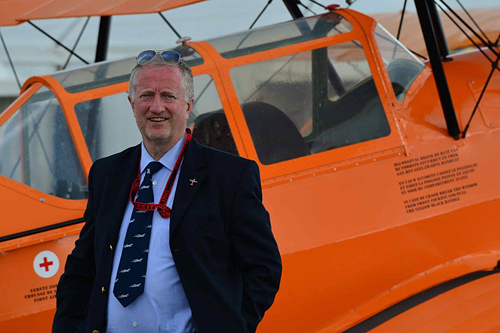 He has always been interested in aviation and his father was often requested to bring him to the airshows in Chièvres and Koksijde in the late seventies and in the eighties. In 1992, he joined the Belgian Air Force as non-commissioned officer to become an air traffic controller. He was on duty in Florennes air base between 1995 and 2000 then in ATCC Semmerzake between 2000 and 2002. He also spent some months in Beauvechain and Koksijde. Philippe left the air force in 2003 to join Belgocontrol, the civilian agency responsible for the handling of civilian air traffic in Belgium. 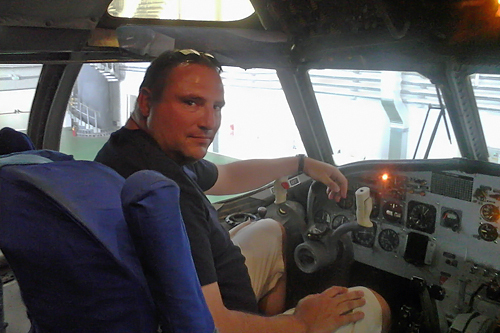 From april 2008, he is an air traffic controller at Charleroi airport. He is also a model builder and aviation photographer, his camera always within reach! Diederik was born in 1973. After first being scared of everything that flies as a very little boy he recalls his first fascination in aviation around the age of 5. Living near the E-40 in Aalter during summer weekends observation exercises were executed in the Alouette II by the Rijkswacht flying regularly over his parent house. He entered the jest fascination at the age of 8 when two Starfighters made a low pass over his school and after seeing his first f-16 solo display at Ursel in 1986 he knew for sure he would become Pilot. Together with his grandfather he went in 1989 to the airshow in Koksijde where he talked to Cdt. Adrieanssens about becoming a pilot. So he discovered the Belgian Air cadets and joined them for 3 years making a dream come true being pilot. 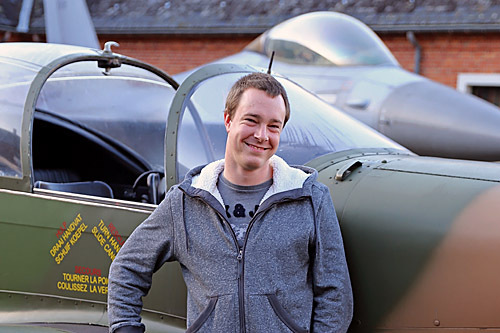 On one occasion in his third year by the cadets he had the opportunity to fly with the SK60 Jet Trainer in Sweden. After this, the flying “career” ended and the main goal becoming a military pilot was not achieved. Passion never ends so he visited airshows regularly together with his friends and of course his son Alexander. Bruno was born in the early 1960’s. After humanities arts and design graduate, he moved-on as independent graphic-designer. 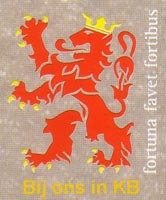 During his military service he was engaged at SID department (Information department of the Belgian Defense, currently IPR) as graphic artist. Afterwards he was hired as teacher at “institute Saint Luc” at Tournai. His teaching domain is also graphics, composition and design. Bruno is interested by aviation since a long time, since the golden years of the “one-O-four”. 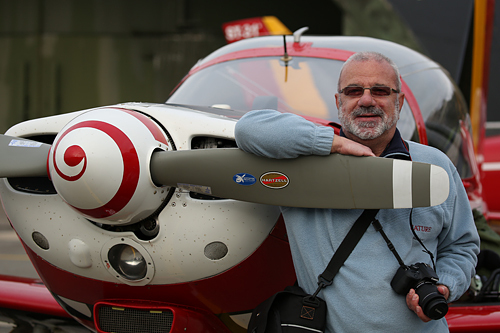 This passion gives him many travel occasions and along the years Bruno became a great fan of the British airshows. He never misses a Flying Legend or a RIAT airshow. He is also an air museum freak and likes to find out wrecks and relics. 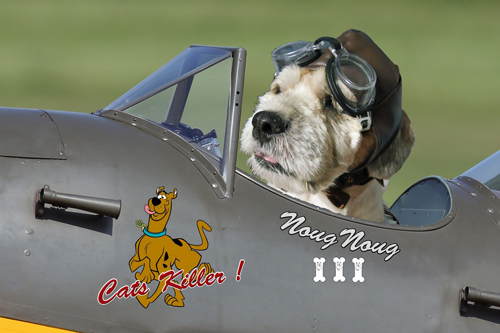 His favorite aircraft is the Mac Donnell F-4 Phantom with its special design and heavy black smoke. Thanks to his formation, Bruno participates to different aircraft painting projects like the Belgian F-16 display 2012 (FA84) as co-designer. 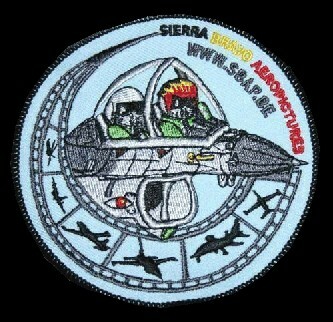 He is also the designer of the patches and logo of the team. Some other projects are on the way, not only for the Belgian Air Force, but this is still “top secret” for the moment…to be followed on SBAP pages. Anthony was born in 1988 in Liège area. After his studies, he got a job in the chemical industry. This is far away of his loved aircraft, but he is still looking for aeronautical opportunities. 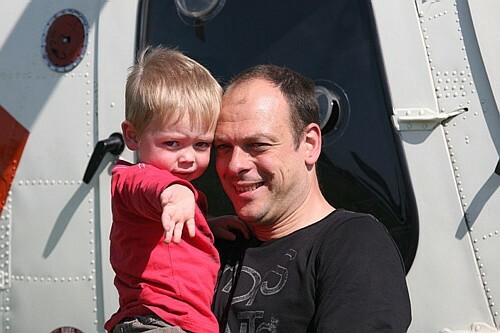 His first airshow was at Zoersel in 1992, this four year old boy was immediately kept by the aircraft virus...He starts the aeronautical photography in 2005 and his major hobby are the Belgian and other countries airshow trying to take pictures of the most "exotic" air forces. Sadly his current job is not in the aeronautical world, but he already made some amazing flight experience like a Fouga flight with the well-known Jack Krine as pilot. As Anthony said, this was an unforgettable moment in his life. His favourite aircraft is the MIG 29 "Fulcrum" and he has a real passion for this kind of combat fighter. Philippe was born in 1954. His passion for aviation started at 5 years of age, when he regularly visited the airport of Zaventem with his parents (when the big terraces were still accessible !) going for other family members coming back from a trip. His father also took him to various and numerous airshows on Belgian airbases during the '60s. In his puberty, he was torn between two vocations : pilot or doctor. He had to cancel the first option, due to a little visual abnormality, which held him back from an aviation career. From that mment he truned his mind towards medecine and started his studies at the UCL in the '80s. This was not a spiteful choice, but a vocation anchored down deep in his heart. He is now a generale practicioner in the Modave region, a country doctor, also largely involved in palliative care and the follow-through of patients at the end of life. But the aviation virus never left him and he fulfilled his military duty as a Medic COR, (candidat officier de réserve) then a Medic. Lieutenant at the Goetsenhoven airbase (EPE-EVS) in 1980-1981, where he had the chance to hobnob in pratical terms with world of aviation and the pilots. He kept in touch with this aviation world and built up a genuine circle of friends. His passion took him through various initiation flights : hot air balloon, glider, ULM and aboard a Cessna. He is also an affectionate of aviation cartoon strips, like the handiwork of Romain Hugault. 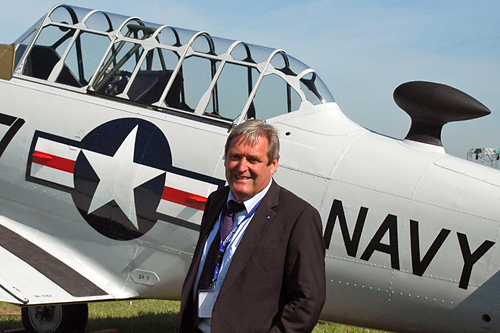 As an aviation passionate he is also a propellor, models and pictures collector. 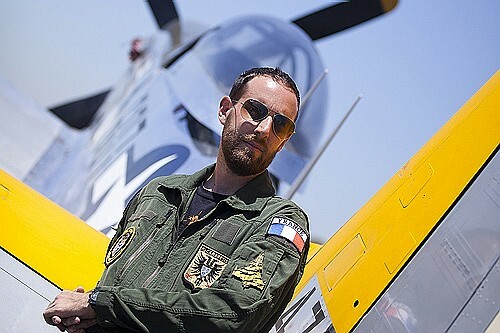 Thanks to all of this, he is able to achieve a part of his aviation dream and to appease a little more this pasion, it is not uncommon to come across him during aeronautical events like Le Bourget, La Ferté Alais, Airbourne and during airshows on Belgian bases. He integrated the SBAP team in 2017 and provides us with his pictures, but rather the artistic than the sporty kind of aeronautical views. Guy was born in 1941. Parallel with his studies, he acquired his degree in flying glider planes with the Belgian Air Cadets and afterwards in Saint-Hubert. In 1962, Guy is accepted at the Belgian Civil Aviation School and as soon as he had his licence he started his career in Libya on a Sabena DC-3 leased to Linair. Back in Belgium he became second pilot on European network connections. Some years later, Guy is affected on the international long haul network. In 1980, he is promoted board commander on Boeing B-737. Some month later Flight Instructor and in 1988 he became Senior Chief Pilot for European network. After a full career with Sabena, Guy made his last flight on July 31th, 1998. During 42 years as a pilot and more than 20.000 flight hours, Guy piloted the “Tiger Moth”, Cessna 310, “Caravelle” Boeing B-707 and Boeing B-737. His leitmotiv : "If it's not Boeing, I"m not flying !" 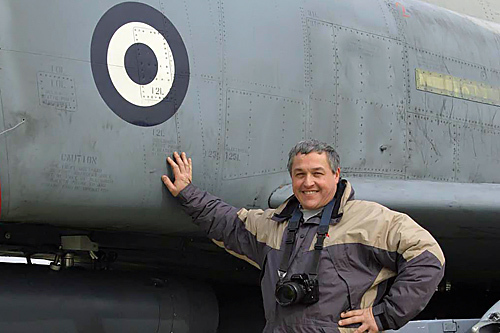 Now in retirement, his passion for aviation is still present and during his travels around the world, Guy make pictures and ensures a collaboration with us since the beginning of SBAP. David was born in 1987. He started his career in telecommunications and IT, where he met Serge. His linguistic knowledge has started his involvement with SBAP, as translator for the articles published on SBAP. His passion for aviation started at a very young age, handed down from father to son. His father, having been a sports flyer for many years on Morane and Cessna, the flying bug was carried on. His favorite airplanes are the Hawker Sea Fury and the marvelous Fouga. Already having attained his paragliding license, and now working on obtaining his sailplane license, no doubt the future only will bring more blue skies. As an avid RC-model “pilot”, he is currently working on a 1,20m wingspan, flying replica of a “Marchetti” of the Red Devils. More on SBAP soon! Régis was born in 1979 in Nice (FRA). After reading chemistry at University he turned to Graphic Design and graduated at the top of his class (Institut Saint Luc, Brussels) in 2004. Now living in Nice again he works as graphic designer and art director for the luxury goods and services industry. Even as a child, Régis was an aviation buff, demanding his parents take him to the few airshows organized on the French Riviera. 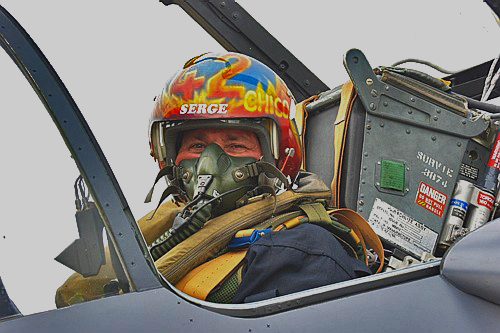 In 2008,wishing to associate his job and his passion, he pontaneously sent a project depicting his vision of a Mirage 2000 in “Tiger” livery to the Escadron de Chasse 1/12 “Cambrésis”. Two years later, he became the designer of the “Tiger” Mirage 2000 for the 2010 Volkel Tiger Meet. He then designed the “Tiger” J3 Piper Cub belonging to the L.Blériot aeroclub that opened the 2011 Cambrai airshow in front of 70,000 spectators. In 2012, Régis' collaboration with the Cambrésis Escadron took off again! 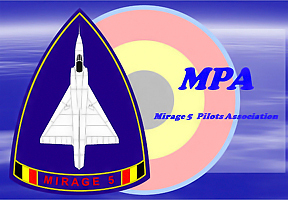 For the 60th anniversary commemorations and the dissolution of EC 1/12 he designed the complete livery of a Mirage 2000 as well as that of two tails: that of a Mirage 2000 and that of a Rafale (Escadron de Chasse 1/7 “Provence”) for the transfer of SPA 162 Tigre to this unit. As for civil aircraft he designed a new livery for the Cambrai Aeroclub Piper J3, corresponding to these events. In recognition of the excellence of his work, Régis was made Honorary Member of the Escadron de Chasse 1/12 “Cambrésis” and was awarded the unit's official badge by the unit's Commanding Officer at an official ceremony.As a consequence of his artistic training, photography is for him an exercise in the field of “aesthetics”, he is active as a fashion and theatre photographer. Following a number of encounters and opportunities, he has now become a photographer for various airshows, to his greatest delight! He has been working with us since 2011. Paul was born in 1952 in Elisabethville (former Belgian Congo). 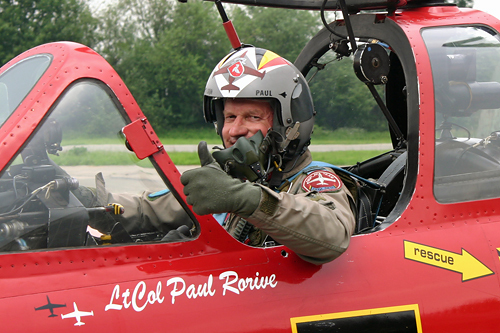 Graduated Industrial Engineer in 1976, he joined the Belgian Air Force in 1977 and flew during training on Siai Marchetti SF 260, Fouga Magister and T-33 (T-Bird). Getting his pilot's Wings in 1979, he completed an operational conversion on Mirage V and was assigned to the 1 Fighter Bomber Squadron "Thistle" in Bierset. In 94, after almost 15 years flying on Mirage V (2000 flying hours), he moved to the training world as CO 7 Squadron Advanced Flying School "Red Cocottes" on Alpha-Jet (600 Hrs). From 96 till 99, he became instructor T-37 (1350 Hrs) within the Euro NATO Joint Jet Flying Training (ENJJPT) in Wichita Falls (Texas). Back in Belgium in the 1 Wing at Beauvechain, he became CO of the 7 Sqn (TEC - Training and Evaluation Center) and was flight-instructor on Fouga (1400 Hrs) and Marchetti (1200 Hrs). From 2002 till 2007 he performed 6 years as Solo Display pilot on Fouga. After his retirement he continued flying for the BAF as tow pilot within the Royal Belgian Air Cadets on Piper PA18 (600 Hrs) till 2012. Aviation being his passion, almost an addiction, looking for keeping with the sky, he flew with paramotor for 7 years. Nowadays, he came back to the "real aviation" by buying an ULM Rans Coyote II. He is married to Anny and has 2 sons, Marc and Olivier. Besides being airborne as much as possible (he totalises more than 8000 flying hours), his hobbies are motor biking and R/C model flying. Pierre was born in 1954. Since he was a young boy, Pierre Taquet developed a true passion for aeronautics and its history in particular. After graduating as a mechanical civil engineer and his military service, he joined SONACA in September 1979, first to contribute to the studies of the Airbus A310 Leading edge Slats. Within a career of more than 35 years, he progressively evolved from technical matters to programs management and business development. While keeping a significant interest for new technologies and especially composite materials, his privileged activity was the space business, which he personally triggered at SONACA. In the meantime he had also been the SONACA proposal manager for the successful B-Hunter UAV proposal to the Belgian Defence and Program Manager of the C-Series during its initial phase (2005-5009). Over a period of 30 years, his activities ranged from the Hermes spaceplane, satellite platforms such as SPOT5, Pleiades, Corot and Musis, Columbus and various other elements of the ISS infrastructure, the X-38/CRV and the Beagle 2 Mars Lander. Till retirement end-2016, one of his latest activities was related to SONACA's contribution to the European Service Module (ESM) of the NASA ORION Multi Purpose Crew Vehicle (MPCV). Pierre joined the team in 2014. Serge was born in 1966. After electronics studies, he start working in the main electronic payment company of Belgium and is now working in the telecom world. When he was a little boy, his parents had a friend working as board commandant on a Sabena Boeing 747. It was the first contact with airplanes world…Since year 80’s, he is passionate with all around airplanes and space exploration. 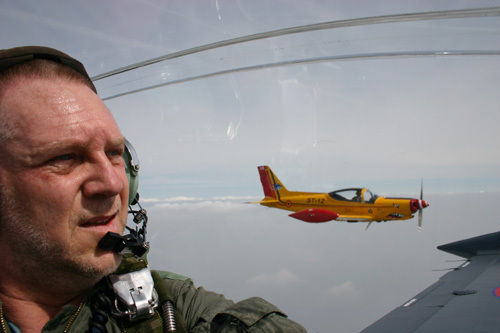 He started photos activities on military airshows in Chièvres and Koksijde. In his first professional activity, he starts to spot with one of his colleague along the Zaventem airfield during lunch time and in the week end. He is now colleague with Serge Van Heertum and discovered new photographic techniques to take the best possible shots… Serge takes also care of the IT aspects of the site. Jacques “Viny” Vincent was born in 1959. His uncle, who was a mechanic at Chievres gave him the 'aviation' virus and as his dad was also a passionate he attended airhsows since his childhood, Koksijde, Chièvres, Beauvechain,... Having also a famous pilot living in his area, he had numerous conversations regarding war facts. This was Raymond “Cheval” Lallemant. Jacques studied as a mechanic and a lathe operator and in 1978 started to work at the Raffinerie Tirlemontoise at Brugelette until the closure of this sugar refinery. Nowadays he is still working for the same enterprise at Biowanze. He is a fan of military aviation in particular and knows the "boss" of SBAP (Tweety) since several years? Never going on vacations (except if there are aircraft in the vicinity) his journeys are principally dedicated to his passion, trying to find "exotic" airplanes. “Viny” is also a talented model builder and an IPMS member for over 35 years. He is also a long time radio controlled modeler, when he ever finds the time... He bought his first still camera, worth this name, with a zoom in 1974 en since then, aviation photography remained his primary passion. Motorcycling is also one of his hobbies. Jacques does not consider himself as a 'pro' but likes to consider himself more as being bitten by aviation reporting in the light of his means and availability. Danielle was born in 1961 and went to primary school in Africa (Zaïre). 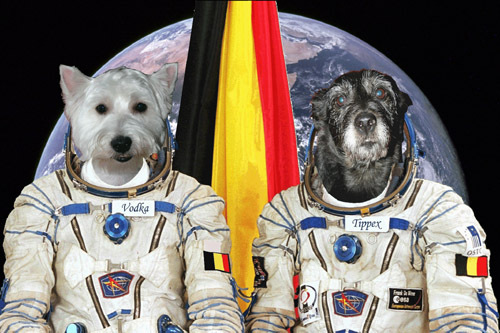 After accounting and linguistic studies in Brussels Danielle started her own translation company. She stopped this activity after 20 years of career. Danielle entered the fascinating aviation world thru her husband Serge. 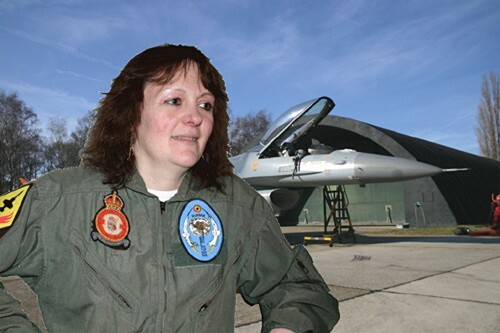 Not really interested in the aviation like the other collaborators, she started the administration aspect of SBAP and makes the follow up of the mails, the shipping and all other administrative task. “It is now important to present the new mascot: "Nougat"
"Nougat" is the guardian of the SBAP office and is main task is to fight the cats...So our mascot is permanentely in Quick Reaction Alert (QRA). No chance for him, his house partner is a...cat! "Daffy". But is second and important task is to taste the meals in the kitchen...miam! “Vodka” was responsible for the QRA (quick Reaction Alert) in the garden. "Tippex" was specialised in the laser pursuit and his job consist in the destruction of any toys entering the SBAP building.